What's the best part of hatching a Hatchimal? Watching your kid's delight as they wait to see what's going to emerge from that colorful speckled egg! It's not a simple process. The little beast inside the egg isn't going to come out until it receives plenty of tender love and care. It responds to love taps, rocking back and forth, and plenty of encouragement. Does that sound like anyone else you know? If your little one loves their Hatchimal then they've probably taught it all sorts of things. It hasn't been long but these little creatures learn fast (it helps that they have a computer for a brain). Your crafty kid has taught this Hatchimal how to speak, walk, even how to dance. Amazing! Countless people have tried to teach us how to dance and somehow, we can't get past flailing our arms and awkwardly rocking back and forth. What we're saying is, Hatchimals of a feather flock together and this Halloween, we think it would be fun for your child to join the Draggle flock! The Draggle is a beautiful purple and blue fluffy dragon baby. 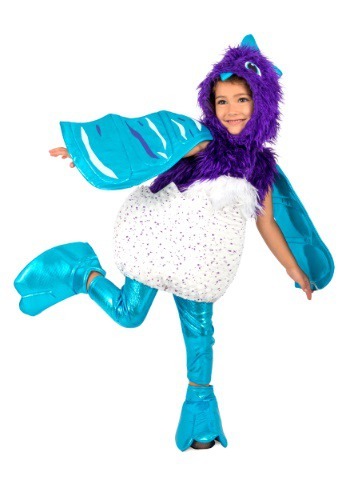 Your child will love the freshly hatched look with the shiny blue wings and fluffy purple character hood. They will be cozy under the fuzzy fabric with big blue eyes and blue spikes making their look more Hatchimalistic. Your child will look like they're emerging from an egg, half a shell makes up the bottom of the tunic. The ensemble is finished off with shiny blue leggings and bright bird-like foot covers. This Halloween is cracked out to be a good one!